This article introduces the best ringtone maker for iPhone 8, iPhone 8 Plus, iPhone X, iPhone 7, iPhone 7 plus, iPhone 6S/6S Plus, iPhone 6, iPhone 6 plus, iPhone 5 and other iOS 11, iOS 10, iOS 9 devices and a detailed guide on how to create your own ringtones, text tones and alerts tone to make your iPhone more stylish. 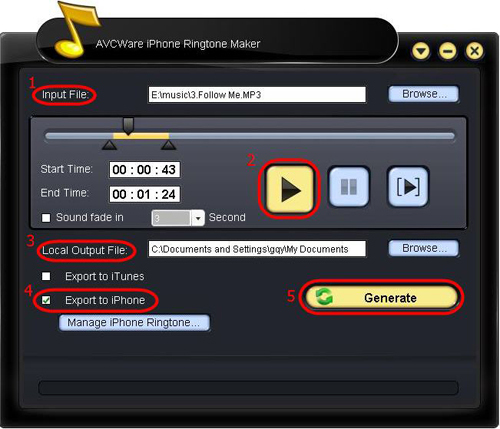 AVCWare iPhone Ringtone Maker turns your dream of making your own iPhone ringtone with loved music into reality in the way of converting almost all mainstream video/audio formats including AVI, MPEG, WMV, DivX, MP4, H.264/AVC, AVCHD, MKV, RM, MOV, XviD, 3GP, MP3, WMA, WAV, RA, M4A, etc. to M4R iPhone ringtone, and transferring the converted M4R ringtone to iPhone 8, iPhone 8 Plus, iPhone X, iPhone 7, iPhone 7 plus, iPhone 6S, iPhone 6S Plus, iPhone 6, iPhone 6 plus, iPhone 5, iPhone 5s, iPhone 4/4s, iPhone 3gs,etc directly after conversion if you want. This iPhone Ringtone Maker can help you clip any music segment from video/audio file and turn it into iPhone ringtone. 1. iPhone 3GS (iPhone OS 3.0) is available. 2. After making iPhone ringtone, this iPhone ringtone maker software can add the converted ringtone into your iPhone directly, thus you can hear the featured ringtone when your friends call you. 3. If you just love a clip in a music file, the iPhone Ringtone Maker helps you set exact start time and end time of the segment and turn it into iPhone ringtone. 4. A built-in music player is available for you to preview source video/audio file before converting. 5. Making iPhone ringtone from your favored video/music file is so easy with this iPhone ringtone converter: add file and convert! 6. English, German, French, Japanese and Chinese interface languages are provided in this iPhone ringtone creator for meeting different mother-tongue users. Download iPhone Ringtone Maker(for Windows, for Mac). Install and launch the program. Step 1: Click the “Browse” button right beside “Input File” label to select the file you want to create ringtone in the window that pops up, then click “OK” button. You will see the file path and name are displayed in the “Input File” textbox. Step 2: Click “Play” button to hear the music before creating ringtone and find the part you want to use. Then drag and drop the start & end slider to get music clip to convert, or type the start & end time in the corresponding text box directly. Tips: Ringtones shall be no longer than 40 seconds. If you want to make text message or alerts for iPhone 8, iPhone 8 Plus, iPhone X, iPhone 7, iPhone 7 Plus, iPhone 6S, iPhone 6s Plus, iPhone 6, iPhone 6 plus or other iOS 10 and iOS 9/8 devices, set time length 2-5 seconds or longer than 5 seconds. Step 3: Set output destination by clicking “Browse” button on the right side of the “Local Output File” label. Step 4: If you want, check “Export to iPhone” option to let the program upload the output ringtone to your iPhone 8/8 Plus, iPhone X, iPhone 7/7 plus, iPhone 6s/6s plus or other iOS 11/10/9/8 device directly after conversion. Step 5: After all above are finished, click “Generate” button to start creating your own iPhone ringtone. During the creation, you can check the process by the progress bar at the bottom. Just in a few minutes, you make your own iPhone 8/8 Plus, iPhone X, iPhone 7/7 Plus, iPhone 6S/6S Plus, iPhone 6/6 Plus, iPhone 5, iPhone 5s, iPhone 4/4s, iPhone 3gs or other iOS 10/9/8 device ringtone from the loved music. * Added the display of audio waveform for more precise adjustments of start point and end point. * Improved user experience in ringtone editing to make ringtones for iPhone more handily. * Added the function of appending ringtone files from PC to iPhone directly. * Added the function of renaming ringtones on iPhone. * Added the function of exporting ringtones on iPhone to iTunes and PC. How to Embed/Add Videos MKV, MP4, WMV, AVI to PDF on PC/Mac?